The evidence for a Mott–Hubbard type metal–insulator transition (MIT) is presented in the xP2O5− yV2O5− (100− x − y)WO3 glass system (PVW) at a critical concentration of tungsten (W) ions. Electrons contributed by the reduced vanadium (V) and tungsten (W) ions are self-trapped to form small polarons, and the hopping motion of such charge carriers is the universally accepted transport mechanism. Whereas both the V and W ions are present in multiple oxidation states in these glasses, charges at the V4+ (reduced) sites contribute only to electrical conduction. We demonstrate that, in PVW glasses, electrons at the reduced tungsten sites are too strongly localized to contribute to electrical conduction, but the oxidized state still contributes an available orbital for electrons to tunnel through. This secondary contribution of the tungsten ions greatly facilitates small polaron hopping (SPH) conductivity. With decreasing vanadium concentration [nV= V/(V + W), where V and W are the molar concentrations of V and W ions in this equation], as the inter-atomic distance between V ions increases, the resistivity remains invariant in the composition range 0.5 < nV < 1. However, a sharp increase in resistivity is observed at nV ∼ 0.5, when the tungsten localization radius collapses drastically. Such a transition is similar to the Mott–Hubbard type MIT observed in many crystalline systems. 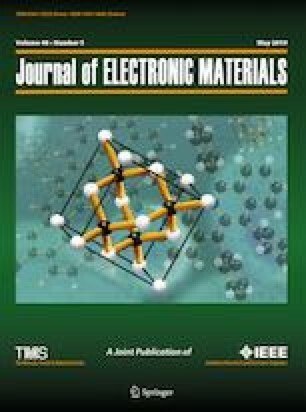 We have demonstrated that MIT in PVW glasses occurs at a critical V–V distance, drastically changing the transfer integral between V sites and forcing conduction to take place through the deeper and energetically disfavored tungsten orbitals.